Chemotherapy Side Effect Series has practical steps and advice to help you manage eighteen (18) different side effects from chemotherapy, so you feel better during treatment. Advice to people who are coping with anemia during chemotherapy. Advice to people who are coping with appetite changes during chemotherapy. Advice to people who are coping with bleeding during chemotherapy. Advice to people who are coping with constipation during chemotherapy. Advice to people who are coping with diarrhea during chemotherapy. 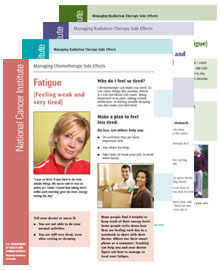 Advice to people who are coping with fatigue during chemotherapy. Advice to people who are coping with hair loss during chemotherapy. Advice to people who are coping with infection during chemotherapy. Advice to people who are coping with memory changes during chemotherapy. Advice to people who are coping with mouth and throat changes during chemotherapy. Advice to people who are coping with nausea during chemotherapy. Advice to people who are coping with nerve changes during chemotherapy. Advice to people who are coping with pain during chemotherapy. Advice to people who are coping with sexual and fertility changes for men during chemotherapy. Advice to people who are coping with sexual and fertility changes for women during chemotherapy. Advice to people who are coping with skin and nail changes during chemotherapy. Advice to people who are coping with swelling during chemotherapy. Advice to people who are coping with urination changes during chemotherapy.